A pictogram or pictograph is a symbol representing a concept, object, activity, place or event by illustration. Pictography is a form of writing in which ideas are transmitted through drawing. Such pictograms are characterized by their simplified style, which omits all details that are unnecessary to the desired communication. It is the basis for some of the earliest forms of structured written languages, such as Cuneiform and, to some extent, Hieroglyphs. Pictograms are still in use as the main medium of written communication in some non-literate cultures in Africa, the Americas, and Oceania. Pictograms are also often used as simple symbols by contemporary societies providing a form of communication that is free of language-specific elements and thus can be understood by all. Efforts have been made to develop standard pictograms for use throughout the world, reflecting the increasing needs and desires of humankind to have relationships and communicate with all people without barriers, such as those created by diverse languages. Both pictogram and pictography share the same Latin root, pict(us), which roughly translates as "painting." It can be combined with either the ending gram or graph, forms meaning “drawn” or “written.” Thus, both terms refer to a pictorial sign or symbol, or a record consisting of pictorial symbols such as a prehistoric cave drawing or a graph or chart with symbols representing the numbers of various items. The term graphy, the combining form denoting a process or form of drawing, writing, representing, recording, or describing combines with pict(us) to form pictography, which thus refers to the act of creating a painting or picture. A pictogram that represents a single idea or meaning may be termed an ideogram. Those that stand for individual words are called logograms. Pictographs may also be drawn or painted on rocks, in which case they are known as rock art, although the terms "petrogram" and "petrograph" also apply. 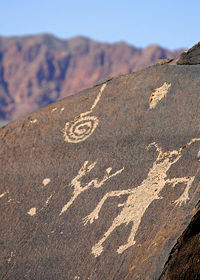 Pictograms that are carved into the rock are termed petroglyphs. A geoglyph is a drawing on the ground, or a large motif, (generally greater than four meters). Some of the most famous negative geoglyphs are the Nazca Lines in Peru. The term icon is used for pictograms on computers and other electronic devices; with emoticon the term for symbols used to convey content that is specifically emotional. The earliest pictograms were in use in Mesopotamia and predated the famous Sumerian cuneiforms (the oldest of which date to around 3400 B.C.E.). As early as 9000 B.C.E. pictograms were used on tokens that were placed on farm produce. As civilization advanced, creating cities and more complex economic systems, more complex pictographs were devised and used on labels for manufactured goods. Pictograms eventually evolved from simple labels into a more complex structure of written language, and were written on clay tablets. Marks and pictures were made with a blunt reed called a stylus, the impressions they made were wedge shaped. As the use of pictograms increased, so to did their meaning. Certain signs came to indicate names of gods, countries, cities, vessels, birds, trees, and so forth. These are known as "determinants," and were the Sumerian signs of the terms in question, added as a guide for the reader. Proper names continued to be usually written in purely ideographic fashion. From about 2900 B.C.E., many pictographs began to lose their original function, and a given sign could have various meanings depending on context. The sign inventory was reduced from some 1,500 signs to some 600 signs, and writing became increasingly phonological. Determinative signs were re-introduced to avoid ambiguity. Pictograms were also used by the ancient Chinese culture since around 5000 B.C.E. and began to develop into logographic writing systems around 2000 B.C.E. Variations of pictogram usage can also be found in other ancient civilizations, such as the Aztec, Mayan and other South American empires. However, as written and spoken languages began to converge and develop into more phonetic and literal meanings, the usage of pictograms diminished. Yet, the origins in the form of pictograms can still be seen in many modern languages, even if not on an overt or conscious level. For example, the letters of the Roman alphabet contain their origins in pictograms. The letter A, for instance, represented the head of an ox, and if it is turned upside down, a bovine head with horns can be seen. Pictograms are used in most modern societies, often serving as signs or instructions that do not depend on language-specific words. Because of their graphical nature and fairly realistic style, they are used in a universal manner, so as to be more widely understood. Some of the most universal pictograms are the ones used for caution in regards to dangerous materials and environments, such as the symbols for radioactive, bio-hazardous, poisonous, and flammable items. However, finding universally understood symbols is not easy. For example, a pictogram of a man and a separate one for a woman are sometimes used to denote public male and female washrooms respectively, so that anyone, regardless of their language abilities can understand where the washrooms are located and which one to use. However, even these symbols are culture-specific. For example, in some cultures men wear dress-like clothing, and so a pictogram that uses a skirt-like shape to denote a female may not be universally recognized. The DOT pictograms in the United States came from a 1974 finding by the United States Department of Transportation (DOT), which recognized that a standardized set of roadside pictograms were needed for the United States Interstate Highway System. The American Institute of Graphic Arts, Roger Cook and Don Shanosky of Cook and Shanosky Associates were all commissioned to develop this standardized system, and researching modern pictograms on a worldwide basis, the team produced 34 distinct pictograms. By 1979, 16 more symbols were added to the system, which brought the total to 50, where it remains today. Today the DOT pictograms are used at such places as airports, train stations, hotels, and other public places for foreign tourists, as well as being easier to identify than strings of text. As works of the United States government, the images are in the public domain and thus can be used by anyone for any purpose, without licensing issues. DOT pictograms representing, from left, "Escalator (up)," "Nursery" and "Ground transportation". The symbol used to represent parking areas. Indicating a transit route that uses accessible vehicles. A pictogram warning against swimming due to crocodiles at the Australia Zoo. "No Dogs!" sign in Spain. The dog illustration is a pictogram. The red circle and bar is an ideogram representing the idea of "no" or "not allowed." ↑ Dictionary.com, Pictogram Dictionary.com Unabridged (v 1.1), Random House, Inc. Retrieved July 10, 2008. ↑ Dictionary.com, -graphy Dictionary.com Unabridged (v 1.1), Random House, Inc. Retrieved July 13, 2008. ↑ 3.0 3.1 Center for Instructional Innovation, The Invention of Writing Western Washington University, 2006. Retrieved July 10, 2008. ↑ 4.0 4.1 Marc Van de Mieroop, Cuneiform Texts and the Writing of History (Routledge, 1999, ISBN 0415195330). ↑ William Wu, Chinese:Pictograms William Wu, 2002. Retrieved July 10, 2008. ↑ Andrew Robinson, The Story of Writing: Alphabets, Hieroglyphs, & Pictograms (Thames & Hudson, 2007, ISBN 0500286604). The Professional Association for Design for the U.S. Department of Transportation. Symbol signs, 2nd ed. New York, NY:American Institute of Graphic Arts, 1993.